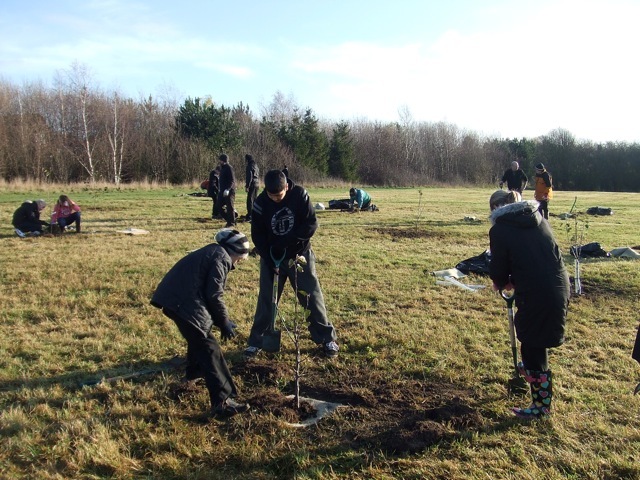 A Community Orchard has been created in the western most field of the Millennium Wood Park nearest Moorway Lane. The trees are now producing fruit. If it helps we will put up posters explaining when which fruit ripen and when to pick them. Brogdale Collections - national fruit collection, orchards, identification, courses, etc. Orchard Network - working together for traditional orchards, biodiversity, courses, etc. - To plant new trees - replacing 22 lost to disease and damage and planting 40 new trees is a new section of the orchard - in about 20 different varieties of apples, pears, cherries, plums, etc. Some will be old favourites, some will be heritage varieties, to help to preserve the wonderful choice of orchard fruit that we have in this country. Including some crab-apples, a cider apple, apples original to Derbyshire, pears and plums. also with names of larger sponsors of the appeal. - To install a bench for visitors to enjoy the view of the ‘old’ (2011+) orchard with the view over the Trent Valley. We are very grateful for the donations received during and after the campaign. The CrowdFunder campaign raised £995, which after expenses gave enough money to replace the 22 lost trees in the ‘old’ Orchard, together with supports, weed mats, rabbit guards, etc. The planting will again be assisted by Derby Moor Academy pupils. Further donations will enable us to plant more trees and plan the information board. Thank you for all your support. For the CrowdFunder campaign we created a fruit tree design which is very attractive on a T-shirt or sweat-shirt. If you would like a shirt printed with a design to encourage you to make a donation then do email us via the Contact page. The designs can be seen on our webpage. Please, help create the best community orchard in Derbyshire !! Overseal Community Orchard, near Swadlincote, Dbys. Kirk Langley Community Orchard, Dbys. East Markham Heritage Orchard, Notts, NG22 0SS.